It's the participation that counts Rog, not the winning. I probably speak for everyone here to say i really enjoy your reviews as they are mainly of a genre I know little about. Thanks, guys! I will still try to see what I can see...I'll check a few more messages and then go off to watch something else. I don't know, could it be...a western??!! 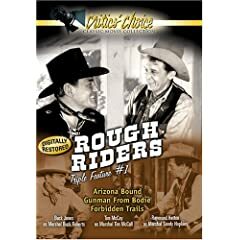 This is the second film in the "B" western series of the Rough Riders which starred Buck Jones, Tim McCoy and Raymond Hatton and is considered the best of the series. It is a slightly confusing plot (as was the the first of the series, Arizona Bound). In it, Buck Jones is apparently an outlaw while Tim McCoy is a marshal and Hatton is a cook on a ranch. Unbeknownst to the other characters, the three are really friends working secretly together. The story actually begins one rainy stormy night where Buck (as Bodie) comes across a couple who have been murdered by rustlers and he finds them dead but their baby is still alive and he find the woman still holding a note naming their killers. It's okay...not great...and the picture quality is just so-so. I first became aware of Suzanne Westenhoefer as a panelist on GSN's new version of I've Got A Secret that aired a couple of years ago. They had a gimmick with their four regular panelists...all were gay. I enjoyed the show and Suzanne quickly became a favorite of mine. I soon found out she was a stand-up comedienne so I went in search of her releases. She has now released 3 solo albums (as well as appearing with others on a couple of group efforts) and has now also released two DVDs of her stand-up act, of which this one was the first released. In the opening, she is billed as the funniest lesbian comedienne out there and she is indeed very funny. Being the animal lover that I am, I find her bits on her animals (especially the cats) among the funniest bits to me. Though she is a lesbian and she does talk about her girlfriend, she never gets particularly lewd so I doubt this would offend too many people but it's still very funny. I believe this first DVD set came out in 2004. Her second DVD, A Bottom On Top, came out in 2008 which was only 4 years later but she actually looks quite a bit older and frumpier (unless my information was wrong and the Village concert is actually earlier than I thought). I still find her very funny and I'm glad to have both of these concerts on DVD. Both DVDs have interviews with Suzanne. This is basically a remake of the film The Shop Around The Corner in which two people who work together don't realize they are the same people each other is writing anonymous love letters to. In this updated version, they are exchanging e-mails and don't work together but work at competing book stores. 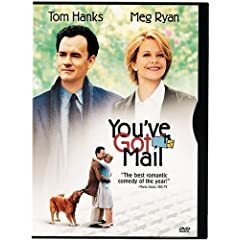 Meg Ryan is at her cutest and perkiest in this film...I haven't seen her lately but I wonder if she's doing this kind of movie anymore...can a woman in her 40's (which she must surely be by now) still be that cute and perky? Probably not. I've always thought that Tom Hanks' character in this movie was actually something of a jerk but he has his good moments as well. I like much of the supporting cast, especially Jean Stapleton and Greg Kinnear. Okay, I've decided to end my marathon here. I had dialysis today and, as often happens on those days, I can already feeling myself get tired...and if I manage to stay awake I plan to watch The Big Bang Theory and the other CBS comedies I like. I just don't see myself able to watch and review 4 more titles today and I don't want my marathon to go into December since a December marathon is already looming. I got behind and wasn't quite able to catch up but I don't think I did so bad since this was really the first community marathon I really took part in. Do I get a passing grade? Or an incomplete? I am very happy you shared your movie reviews. It was wonderful because you like a genre I have not watched too much of. I've added quite a few to my wish list since because of you...maybe I should start charging you! You definitely pass Roger! Enjoyed your reviews... glad you joined in!